Portal of Destiny in Galactic Center. he barely holds the enormous Serpent that had coiled around Him. Its forked-tongue hangs down beside its Blissful Head, Held powerless to speak. A Glorious Crown then appears Above its head. Ophichius then turns his willing gaze toward His next Call of adventure. the separate self is no longer seen in Time. bring us back to Our Garden and The Tree of Life! Blavatsky often spoke of the serpent initiates or wisdom serpents who were initiators of knowledge and carried forward and synthesized the unitary knowledge of the previous root races. Prepare for the New Beam! (Nature=Truth) HEAVEN ON EARTH. Planetary Moon 8: Rhythmic Wizard year. Kin 213, Red Overtone Skywalker. (2009-2013), the final four-year bundle of the Sixteen Year Cube of the Law. It is a momentous year, when the Great Cycle Closes and the new cycle begins. Moons 1-5 complete the last of the 7 Lost Generations of Pacal Votan that began in the Crystal Moon of the Rhythmic Wizard year. Note that the seven last whole moons of 2012 = 7 Lost Generations of Telektonon of Pacal Votan. In the sixth moon of this year the Earth passes out of the 5,125-year galactic synchronization beam. The purpose of the beam is to place Earth in synchronization with the universal plan for cosmic unification. The peak point of the synchronization occurs Rhythmic Moon 9, Kin 207. (Careful attention should be paid to the 7:7::7:7 practices based on the four sets of fractal time compression cycles which hold keys to the closing of the cycle). Following the Rhythmic “Moon Out of Time,” there is a seven moon (216-day) entrainment in the beam that completes itself on Kin 164, Yellow Galactic Seed, 26 July 2013. In the formula of the Riddle of the Stone, the spiritual cosmic evolutionary key to the four years of the Mystic Altar lies in the formula of the magical word TEL-EK-TON-ON. It is this mantric code that creates the mystic altar of time. The mystic stone is the new foundation of universal time that underlies the noosphere. TEL – 4 Seed year, 2009-2010, Power of the Distant Seers – Skywalker Cube 13. EK – 5 Moon year, 2010-2011, Power of the Star Born to Remember – Wizard Cube 14. Seven Years Mystery of the Stone complete—Restoration of cosmic memory to the noosphere. TON – 6 Wizard year, 2011-2012, Power of Sound to Become Vision – Eagle Cube 15 – First Alpha stage of UR, miraculous powers and abilities begin to return. ON – 7 Storm year, 2012-2013, 144,000 cubed within – Warrior Cube 16 – Second Omega stage of UR, entrainment of the new cosmology of the Cube, redemption of the ratio interval of 7 as the dawning of the 7th Day of Creation, triumph of the noosphere. It is important to understand that the word TEL-EK-TON-ON is a magical mantric formula. This mantric formula vibrates through the four years of the Mystic Altar as the intonation of the Hunab Ku, the final hyper-sound generated by the 5,125-year synchronization beam. It is this sound that provides the resonant quickening for the quantum shift of the Harmonic Convergence 2012. The name far distant star born is of course TEL-EK-TON-ON. Those who are listening to this intonation are the six seers – the three special messengers of the Awakening: Buddha, Christ, and Muhammad; and the three special voices: Padmasambhava, St. John of Patmos and Quetzalcoatl. The seventh that intones the distant star born name is Pacal Votan. The Resonant Storm year is thus coded by the last mantric syllable “ON”, the indestructible power of the 144,000 within the Cube: New Heaven, New Earth, Divine Self-Perfection. With the mantra “ON”, we evoke the indestructible power of the 144,000 within the Cube. Through the Planetary Manitou the 144,000 cubed within the cube of their own divine self-perfection walk simply on the Earth as wizards of a time now unknown to all but them. The Planetary Manitou is the self-realized world soul that pervades the natural world, the Noosphere. 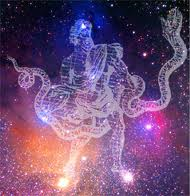 It represents the wiring of the galactic brain on earth and the psi bank which activates and “lights up” because of conscientious activity that connects together the star bundles, the runes the codons, etc. This entire program has for its purpose the laying of the foundation for a fundamental reorganization of the mind—everything is a function of a mathematical harmonic or order. Now is the time to apply everything you know like never before; purify the body and mind and return to the simplicity of the organic order and the universal rhythms of 13:20 time. This year we are called to exert in the telepathic practices that we began in the Self-Existing Seed Year. The purpose of these practices is: 1) To strengthen the telepathic Earth network – the goal of the CREST13, and 2) To establish extra-terrestrial communication, that is, to connect with the galactic intelligence that encompasses the solar-terrestrial psycho-magnetic field. This year completes the final activation of the Nine Great Lha or Bolontiku, the Nine Lords of Time that guard the tomb of Pacal Votan, the whole earth and the new time. Each one guards a power of the divine perfection in the unconscious during the years 2004-2013. This year we awaken the ninth great Lha, Primordial Knowing Body Lha, the one who closes the cycle as the Rainbow of Universal Wisdom and activates Shambhalla on Earth. We must energetically now leave the old behind us. Its habits, ways of life, intoxicating illusions and seductions are like a pile of dead leaves, which at the right moment will be caught up by a cyclone to be swirled and dispersed forever. Don’t be swept along with the old when this wind arises! Purify now! Note: The 216-day cycle (22 Dec. – 26 July) is a time of planetary spiritual unification and integration. This is the time that will form a new evolutionary embryonic being, that will germinate for seven mystic moons (Moons 7-13), before giving birth to itself on July 26, 2013 with the Return of the People of OMA (Original Matrix Attained) and launching of Timeship Earth 2013. These seven moons occur altogether within the 216-day cycle of the cubing of the Earth. Wave and 2012: The Final Cycles of Transformation).